The Rice Laddus are by far one of Mangalore’s most favourite sweets which has been around for ages. While it is made by people of all religions, it has a special place in the ‘Kuswar’ made by Mangalorean Catholics for Christmas. Kuswar is an assortment of sweets & savouries – I will dedicate a separate post for them shortly. Not too many people make the entire Kuswar (the whole range of sweets & savouries) anymore as it’s easily available at bakeries & sweet shops in and around Mangalore. 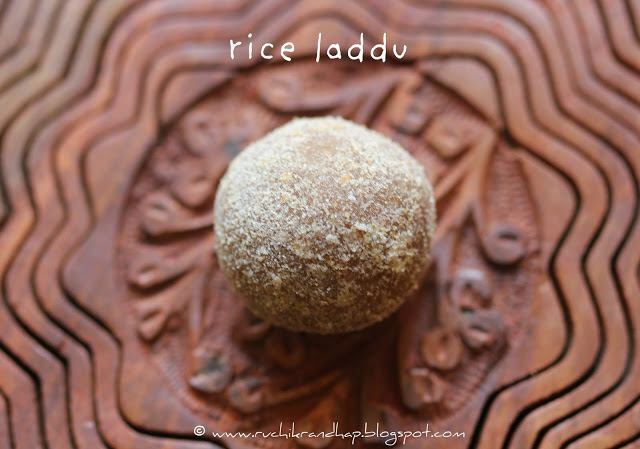 However, the Rice Laddu is something that many people prefer to make in small quantities at home so that it can be consumed fresh & finished before they turn hard & stale. Although my mom joined the bandwagon of making just the basic sweets & buying the rest from the famous M.D’Souza & Sons – Bakers, Confectioners & Caterers of our times, she would never fail to make the Rice Laddus. My mum-in-law who taught me to make this lovely sweet tells me that in the olden days it was made at home by the rich & poor alike – even by those who couldn’t afford to make expensive sweets at home would at least make the humble Rice Laddus made out of unpolished rice, jaggery & coconut – staple items in every poor man’s house. The roasting of the rice helps the grains to fluff up & lends a nutty flavour to the Laddus. This along with the mild taste of jaggery soaked with shreds of fresh & juicy grated coconut just melts in the mouth. The sesame provides the surprise factor when you get to bite into a couple of them when you are busy munching the Laddu. The pinch of salt should not be underestimated as it brings out all the lovely flavours. The mild fragrance of cardamom blended with roasted & powdered rice is something that lingers on – not just in your kitchen, but on your taste buds too! So try this anytime – it hardly takes 15-20 minutes to make it! 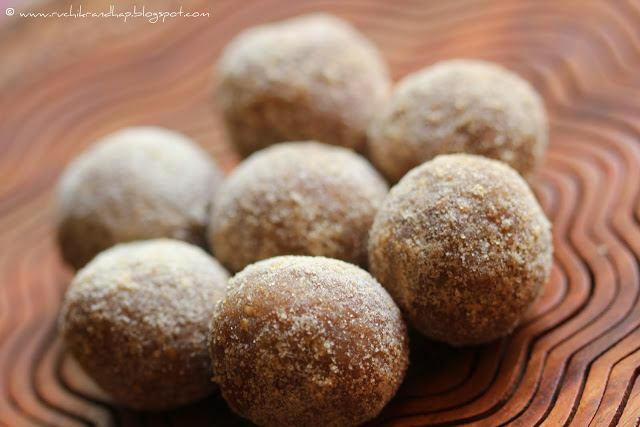 Rice Laddoos are part of traditional Mangalorean Kuswar (Christmas Goodies). 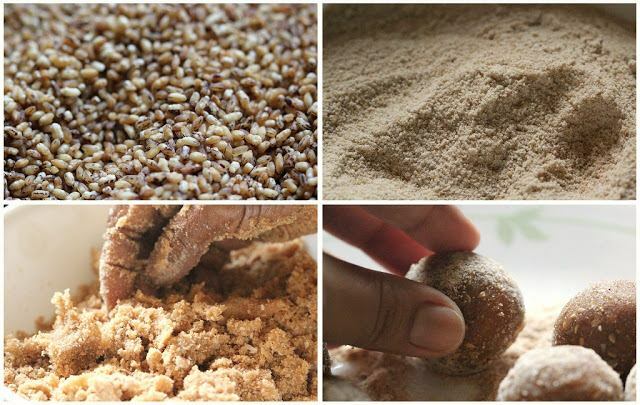 They are made with brown boiled rice (a variety of rice), jaggery, fresh coconut, cardamom & sesame seeds. 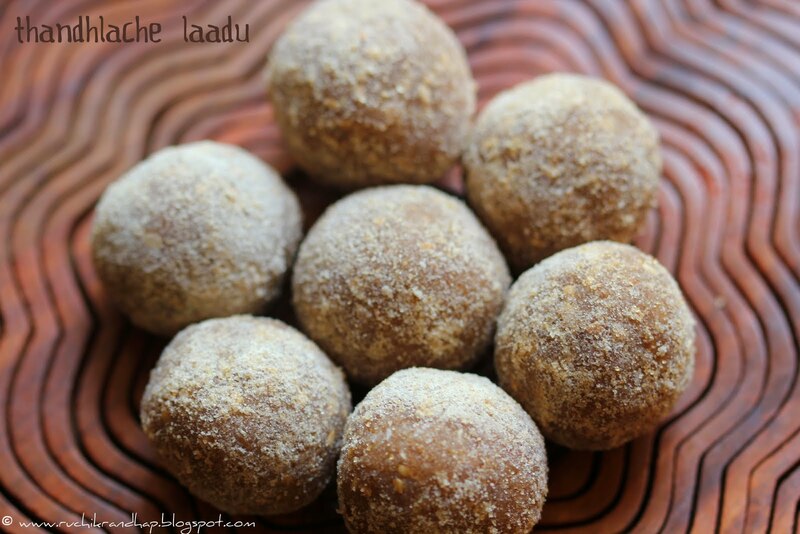 These laddoos are healthier than regular store bought sweets and are gluten free, vegan & contain no refined sugar. Wash the rice and dry it well. Mix the jaggery & coconut mixture with the rice powder. Add the sesame seeds & pinch of salt. Mix everything well so all the flavours get incorporated. Take a portion of mixture in your palm and compress in your fist to make a tight ball. The tighter the ball the better you will be able to shape it into a round laddu. If you don't make it tight enough, when you roll it into a laddu the mixture will crumble. Roll each laddu in the reserved flour & serve. Shireen, is it really this easy? Wow ! What happens if you reduce the jaggery? Will you not be able to hold it together and shape them? Ant une zatha gi? Shireen, I tried this recipe today…and God! they are simply superb. I did not get such perfect shapes as I added a few caramelised raisins and cashewnut bits. But I'm sure when you do it the traditional way of pounding them together on a grinding stone, they will turn out fine. and the sweetness, just perfect….simply perfect..thank you for putting this up and please pass on my gratitude to Karmin Aunty for this. Shireen, I hope you got my earlier message. My question now is, why do the laddus become very drye eat? I have eaten soft and moist ones during xmas season. Yours in the pic dont look dry. I feel mine are. Let me know. 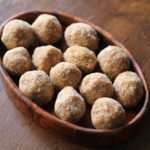 hi shireen… i am really glad that i chanced upon ur blog… my hubby loves thandlache laddoo and we wait for somebody to come from mangalore with it…. just wanting to know … can the rice be ground in a mixie?? Hi Jovi, thanks so much for your compliments..yes the rice needs to be washed, dried and roasted on a slow fire till you get a nice aroma – this gives it the crispiness that will help you to powder it in a dry grinding jar of the mixie. Shireen, you need to send over to me…….. these rice laddoos r to die for and reminds me of what my grandma used to make in Mangalore and parcel to Bombay. I am sure some of this is left in ur kuswar collection. Thank you Anonymous for the lovely comment! Glad to know that the laddoos turned out well 🙂 Sorry for the delayed response! Hi.. Does anyone make these for sale at Mumbai… I loved this stuff. Please do not tell me to go to a mangalore store those are just not the same. The brown rice powder is available at Mangalore Stores. You can buy grated coconut and then the rest is simple. 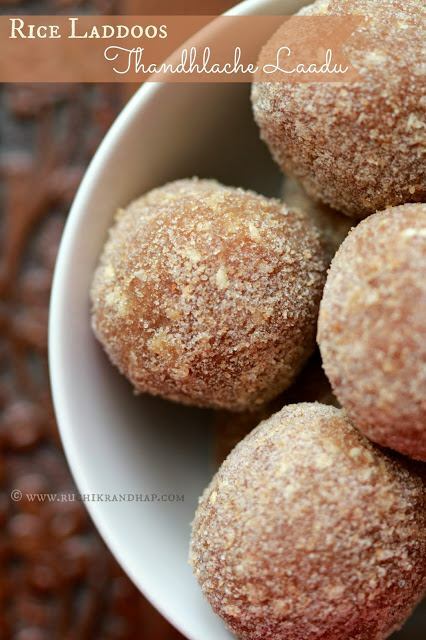 is it possible to use boiled rice powder to make these laddus? your blog inspires me to try something different everyday..thank you. @Rita Dsouza: Thanks so much for the feedback! Glad you liked the kuswar. Wish you a very happy 2014! Hi Shireen.. Can the laddus be kept in an air tight container or in the friidge cause there is coconut iin it.. Should not get stale.. Please advice.. Planing to make this for christmas..
Hi Shireen, can i heat up the jaggery and then add coconut and rice flour? @ Vidya Monteiro: Thanks for your lovely words! I do hope you liked these laddoos! Hi Shireen, I have little extra mixture which I couldn't make laddoo of due to lack of time. Can you suggest how to reuse that mixture to make laddoo coz now they just turn into crumble. Is there any possible way to use my leftover laddoo mixture? Due to lack of time I couldn't complete it. Hi shireen, thank you so much for the wonderful recipe. I have tried it today and it’s delicious. Thanks a ton for your lovely feedback! I am so glad that you liked the laddoos! Do stay tuned for more recipes!